Over the years, Woodhaven Lumber & Millwork has built a reputation as a truss manufacturer that can accomplish unusual designs that work in the real world for customers and installers. We work closely with the architect and engineer and try to make it a simpler install for the builder. 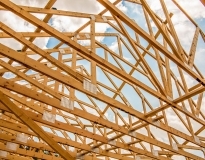 Woodhaven custom manufactures premium quality roof trusses, floor trusses and wall panels. 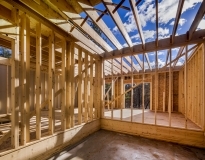 By continuously expanding our capabilities in both design and manufacturing, we can provide the latest, most efficient truss and wall panel construction. No matter what type of job, Woodhaven is dedicated to being your partner from design and manufacturing to reliable, on-time delivery. Our experienced professionals work with state-of-the-art CNC saw technology, which removes the potential for human error, and allows them to cut lumber from 1 inch to over 20 feet. Each truss meets the standards established by the Truss Plate Institute (TPI) and building codes. Our tough quality controls ensure that fabricated truss units and panels are identical in size and have tight, accurate joints and uniformity which will improve installation and reduce overall construction time. Woodhaven is a member of the Truss Plate Institute (TPI) and the Structural Building Components Association (SBCA), and is an active participant in the Mid-Atlantic chapter of the SBCA. 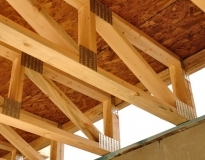 Want to talk about Trusses & Wall Panels?